If you’ve been following me for a while you may have noticed that I am rather obsessed with tea. We’re talking obsessed to the point that I have an entire cabinet full of just tea and four very large teapots in a one-bedroom apartment, obsessed. So when the darlings at Traditional Medicinalsreached out about their Winter Wellness Kit I was undoubtedly excited- a fabulous brand and a chance to try three of their teas and share them with you all? Yes please. Traditional Medicinals is a brand I trust, and have used for quite a while. Their organic Chamomile with Lavender tea (among others!) is a staple in my cabinet and is fabulous for combating stress and sleepless nights! So, needless to say I had high expectations for the seasonal teas in the Winter Wellness Kit and it didn’t disappoint! Each of the three teas are wonderful on their own for promoting wellness throughout the chilly seasons (understatement- it is currently -1 in Denver- brr) and all three together are great to have on hand to help combat pesky winter illness! I swear by Echinacea- an herbal remedy derived from the purple coneflower that helps to boost your immune system. It also acts as anti-infection agent- great for helping to prevent viruses. However, I had never had it in tea form, mainly because I usually take in capsules (if you’re looking for a recommendation pop over to my Preventing Spring Sickness post!) but also because I had expected it to taste a little too ‘weed-y.’ But, with the addition of lemongrass and spearmint leaf Traditional Medicinals created a tasty blend of herbal tea that can help to stave off that winter sickness. If you happen to have a sweet tooth like myself add a bit of honey and you’re good to go! First off, it is rather silly that this particular blend of tea doesn’t get the ‘organic’ notation. When you peek at the ingredients the only non-organic element is the safflower petal. Yep, a flower petal- so in my books, this blend is organic too! 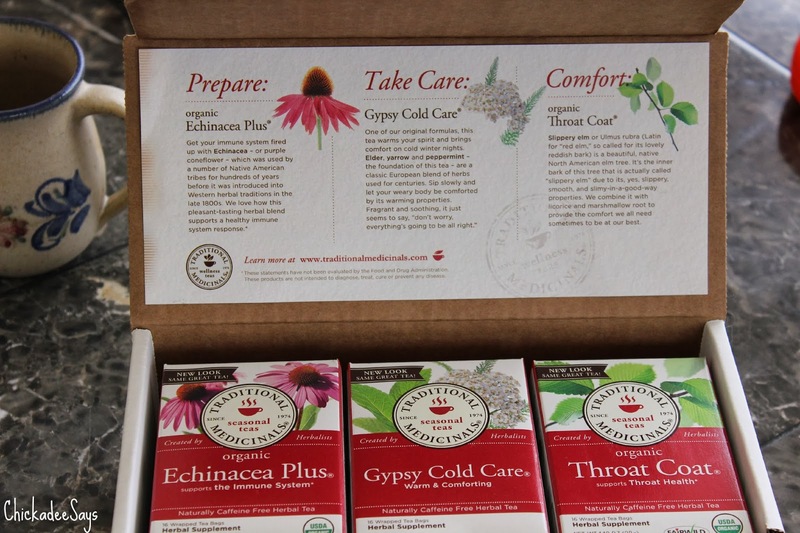 Gypsy Cold Care is amazingly comforting and the box of teas couldn’t have come at a better time as I was feeling a bit under the weather. But the delicious blend of tea had me warm from the inside out- beating the shivers that tend to come with a cold that is sneaking up on you! Made mainly from Elder- an immune stimulant and anti-inflammatory, yarrow- an antibacterial, and peppermint- a decongestant, this blend is an incredible combination of herbals that are made for a holistic way to help fight off cold symptoms! When I mentioned to a group of my girlfriends that a Winter Wellness Kit was on its way to me, I heard a resounding chorus of ‘hope it had the Throat Coat!’ I had heard nothing but great things about this tea, and it most definitely lived up to its hype. 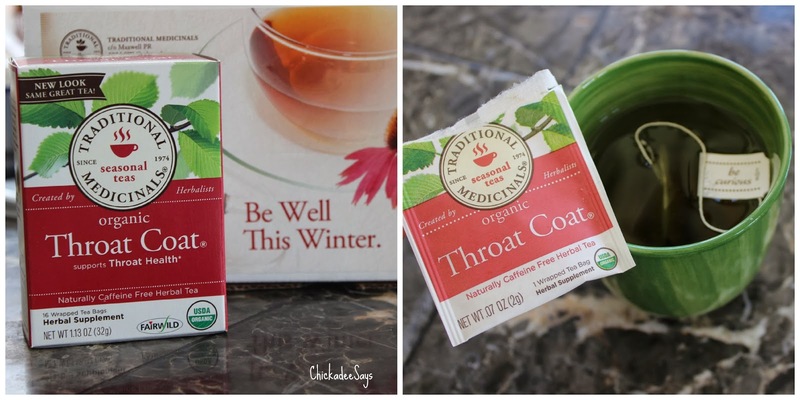 You know an herbal blend is going to be great for your throat when its main ingredients are licorice root, slippery elm, and marshmallow, all herbs that are known for their soothing properties and ability to coat sore throats as the name suggests. Luckily, I didn’t have a sore throat when I was testing out this tea, but I could feel its effects none the less- no raspy morning voice from the lack of humidity in the mountains (this East Coast girl needs to invest in a humidifier ASAP) and a slightly tingly wonderful sensation on my tongue, both of which I know I will enjoy when I do happen to have an unhappy throat! Now, I’m not usually a licorice person, but once again Traditional Medicinals came through and paired the bold flavor with hints of citrus and cinnamon, which made for a lovely and rather aromatic taste- no honey required! I hope everyone has a fun and healthy winter season! I received my Winter Wellness Kit free of charge, however all opinions are my own. Some links are affiliate links. In regards to any health claims made above: This statement has not been evaluated by the Food and Drug Administration. This product is not intended to diagnose, treat, cure, or prevent any disease. Join the Modern Hippie Family!